In the personal finance blogging community, we bloggers can disagree on a lot of things. However, one thing we tend to all agree on is what constitutes reaching the all-coveted status of Financial Independence. Many, including myself, believe in the 4% rule (as a guideline), that defines Financial Independence as a portfolio of 25X your annual “burn rate,” which is the amount of money you spend annually to maintain your desired lifestyle. In other words, the 4% rule is the best guide we have to reaching FIRE (Financial Independence, Retire Early). Do retirees need to rethink the Trinity 4% SWR rule? Since many others have already covered the specifics, and most importantly the math, of why the 4% rule works (and what to watch out for, hello 18-part series linked above), I would like to spend our time together reviewing what I believe to be the five major stages on your path to Financial Independence, based on the 4% rule as the guiding force. Since we believe that extreme frugality is for the birds, today’s example will be based on someone who desires FatFIRE with an annual spending amount of $120,000 per year. It’s funny how that just so happens to be the magic number for the GYFG family – go figure! I believe $120,000 to be the figure that will enable you to “live the good life” in almost any city in the USA and definitely many cities outside the USA except for uber-expensive “tier one” cities with a very high cost of living such as New York, Miami, San Francisco, anywhere “Silicon Valley,” Los Angeles, Tokyo, Hong Kong, Singapore, Paris, etc. The good news is that once you reach Financial Independence, you will also be location independent, and thus have the ability to avoid these extremely overpriced cities – unless that’s your deal, in which case you will need to adjust accordingly. (1) Ground Zero ($0 Net Worth) – Many of us starting out will begin our journeys from a negative position. It’s important to not get discouraged at such an early stage. Remember that it doesn’t matter where you start but rather where you finish that matters. You may have debt from student loans. Or credit card balances. Or car loans. Or medical bills. It can be daunting, and maybe overwhelming! But don’t get discouraged – get busy. In this stage, your goal is to go from negative net worth to zero. You will accomplish this through a combination of saving, investing, paying down debt, and perhaps even by building equity in your home through appreciation (and debt pay-down). At this stage I recommend focusing first on paying down debt, starting with your debt carrying the highest interest rate. This is especially true if you have high-interest credit card debt. If you have a home, this is not the time to start paying your mortgage off early. Build up a small emergency fund of, say, three months worth of expenses (consumer debt is your emergency at this stage, and your biggest threat, so you will focus there before building this emergency fund up higher). Contribute enough to get the maximum match on your 401k (don’t miss out on free money), but then devote all your funds beyond that to pay down all your consumer debt like your life depends on it to get back to even, which is Ground Zero. Debt is for losers. (2) Six Figures ($100,000 Net Worth) – This will be the hardest and most satisfying milestone to reach. The difficulty and time to reach this milestone will depend on how much you start out in the hole (stage one). Some will be fortunate enough to start the journey with zero debt and skip the first milestone altogether. Others might be anchored with multiple six figures of debt to slay. Think about the kind of student loan debt that doctors come out of school with, which can exceed $400,0000 (CRAZY). When Mrs. GYFG and myself were graduating college in 2008 in the midst of The Great Financial Recession, we were weighed down with a negative net worth of almost ~$300,000. It took us until 2012 before we hit zero and eventually ended that year with a positive net worth of $42,000. We didn’t reach the $100,000 milestone until the end of 2013. It felt like forever in those early days, yet we soldiered on knowing that time and consistency would snowball us forward eventually. Reaching six figures is when the journey really starts to get interesting. (3) Double Comma Club ($1,000,000 Net Worth) – Besides joining the double comma club, you have now officially reached an amount that will allow you to spend $40,000 per year (based on the 4% rule), which should be more than enough to cover the bare necessities. You will notice that in this budget that the GYFG household is still carrying an amount on the “Home Mortgage” line and that is related to property taxes. Unfortunately, even after you pay off your mortgage you will always have those pesky – and rising – property taxes due every year. 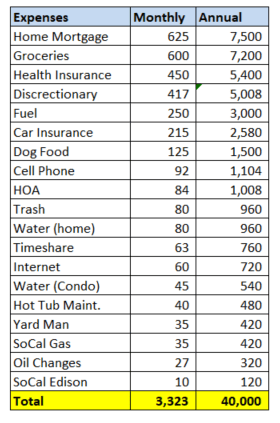 Health insurance costs are a big wild card and what’s presented is representative of what we currently spend in this category, as I have no idea what those costs will be like in the future, with an expanding family, and especially when I’m not employed (a problem for another day). I will also point out that this NOT our current spending, which for the last few years has ranged from the $100K to $120K range. This is our version of a bare bones budget to just exist. Your categories might be different, but I think any household of up to four can survive – although maybe not thrive – on an annual income of $40,000 per year. This is where most of the extremely frugal FI pursuers stop. Not us! (4) The Magic Zone ($1,875,000 Net Worth) – The magical $75,000 per year that the Princeton Study shows to be the optimal level of income for maximum happiness is possible at this point. Based on the 4% rule, a net worth of $1,875,000 would allow you to spend $75,000 per year. The study states that the lower someone’s income is below this benchmark the less happy a person feels. The study did conclude that there was no improvement in happiness above the $75,000 income level, at least not related to your day-to-day mood (emotional well-being). They say money can’t buy you happiness, but this study argues to the contrary. Although there doesn’t seem to be any additional improvement to your day-to-day happiness (the way you feel), the study does point out that income above this benchmark does improve life satisfaction, as in the trajectory of your life overall. Great! At this milestone, you have now reached the limit to the impact income can have on your daily feelings. Growing your net worth beyond this in order to grow your annual income may not have any additional impact on your day-to-day contentment, but now it’s time to optimize for life satisfaction. (5) Financial Independence ($3,000,000 Net Worth) – You did it! You reached Financial Independence based on your desired level of spending. At this point, you now have full autonomy over your life. You no longer have to work for The Man. Go enjoy and live the rest of your days by your design. Although…there might be one more BONUS stage, if that’s how you’re wired. (6) Financial Freedom – If you have made it through the five major milestones above, take a moment and pat yourself on the back. The majority of people will NEVER reach FI and therefore FF will never even be an option. I don’t say that to be mean, just to be real about the majority of the population, even among the FI demographic. Which, to get super-real, is miles ahead of the true average person in this country, who is woefully underprepared for the financial necessities of daily life, let alone retirement. But if you’re reading this post, you, my fellow Freedom Fighter, are not even in the same hemisphere as the average person. I know you may see FI and FF used interchangeably across other blogs in the personal finance blogosphere but here on GYFG they are not the same. Don’t get me wrong – reaching FI will provide you with a nice life, one that you signed up for, but it’s a life that you are now locked into for the rest of your days. Are you sure you will have the same wants and needs 10-30 years from now? I don’t know about you but my wants and needs have changed a lot over the last three decades and I’m willing to bet they will drastically change again over the next three. Maybe I decide to pick up an expensive sport, or have to take care of a family member from time to time, or even indefinitely? How does that fit into my FI plan? The rest is insurance. I believe in insuring your home and automobiles. Umbrella insurance protects your net worth. Until you are truly financially independent, term life and disability insurance are vital, particularly for those of us with a family. Reaching Financial Freedom provides a margin of safety. I would argue that FF makes you that much more insulated from market crashes, like the Great Financial Crisis of 2008/2009, when many asset classes sank 50% or more. Some of us may have a Big Hairy Audacious Goal, like reaching $10,000,000 in net worth – oh yeah, that’s my goal. I chose this number because I want to leave a legacy for my family. I want my family to continue to be able to live well and give well into perpetuity. I want to make my world so big that anyone in it can have anything they desire. Most of all I aim for FF and my $10M goal is where I reach a point where money is no object. I want the FREEDOM to decide to live a bigger life. Give back more. And secretly, deep down I want F-U Money. I can’t define this number for you, as this number is very discretionary and limited by your own imagination, your own ambition, and your very personal vision of your own life. Wrapping Up – With a Gift For You! You now have the five major milestones on your path to FI, and for the really ambitious (or extra cautious and paranoid) the bonus sixth milestone to reach financial freedom. Now if only we had a way to track all of this in an easy and visual way…wouldn’t that be nice? I thought you might agree with me, which is why I created the FI Progress Tracking tool. I made that! Cue the happy dance for all us math and chart addicts aficionados. It’s my gift to you, fellow Freedom Fighter. Use it, enjoy it, and keep me posted as to how you are doing. Remember, what isn’t measured cannot be improved. Rock on, Freedom Fighters. Yikes, quite a ways to go for us, but it’s cool reflecting back thinking about these progressions and seeing how we’ve evolved along the way. Next stop, double comma club. It’s funny reading this post, as my brother has the same BHAG of $10,000,000, i wrote about him here, you can check it out if you have some time. Thanks for sharing the post about your brother. I found it very interesting and a lot in common with your brother and me. My FatFire goal is $130k per year. What Monte Carlo percentage do you consider a “success” at for your $120k goal? I have read that a good range is 75-90%. 85% ideal, in that 100% means ‘why are you still working’. Of course all impacted highly by your spending, return, inflation and longevity assumptions. I use Personal Capital and WealthTrace to monitor things. PC is always a bit rosier in its Monte Carlo percentages. I agree with this. I like your style. I tend to lean towards FatFIRE as well. I’m all for frugality, and I optimize and cut cost at every corner. There is never ever a reason to *waste* money, but being able to live the life you want to live by achieving FF makes perfect sense to me. Being frugle just to survive day to day and considering that financially independent sounds mundane. Good article. Keep pushing. Thanks! I love how FatFIRE has become a thing. My numbers are be very similar to yours. I find ar $120000 I can live just as I want. And at my age I just want less of everything, not more. Stuff takes up too much time. The only place I differ is in the over 3 million category. With my current account I can help kids have no debt from schooling., and with other expenses that are a challenge for them. I will leave a significant inheritance, but not one that does too much for them. Above 3 million I will use it for those that have not had my opportunities. As charity, or in pursuing things not for my financial return, but for expanding the opportunities for others. This excites me much more than making another dollar. I agree that the gap between $3M and $10M should be used to help others – not just those inside the family unit. We plan to set-up a foundation with Mrs. GYFG heading it as Chief Philanthropist Officer. Whew, $10m is crazy to me. Spending $400k a year is over $1,000 a day spending. I guess lunch costs $20 and maybe $80 for dinner, so only $900 more each day haha. That’d be a fun challenge. I suppose you could have a massive house, fly first class and have an expensive car and that could eat up most of that right there. I like the “Magic Zone” number as a threshold too. I know for us once we hit that number in our income, it was where things naturally leveled off and we would have trouble spending more on things that provided maximum value for us. We’ve since tried bringing it down, but I like that as another milestone. Great article, and great 5 milestones. I’ve hit 1-3, working on #4. Don’t think I’ll ever hit #5, because I plan to retire long before I get there. Of course its possible, depending on the market, that my resources might go above that. My hat is off to folks who started pursuing this early in their lives. I really didn’t start getting serious about savings until I hit 36, and didn’t hit the $100K club till 38 (I don’t count my house – that jumps around too much). Mr. 39 Months – Congrats on making it through the first three milestones. +1 on hat tip to those starting this early in their lives. I started pretty early at 27 (at least that is when I was conscious of the pursuit). But today I see people starting at 20 or 21, which is going to be HUGE for them. I love talking to people younger than me and getting them started early. It will give them so many options early in life. I’m interested in hearing more about why $10m is your target. $10m is big fat round number but there’s a huge leap from $3m to $10m. Surely a big part of FI is not having worry about working and earning more money. So if you $3m is already more than enough to fund your life style with a big safety margin, surely this is the time to declare independence from the man. Hi Andrew – There is for sure a BIG gap between $3M (where we will officially be FI) and $10M (where I define FF for the GYFG household). The $10M mark is where I psychologically would feel safe and secure. A 50% decline in the market would not have me worried about needing to go back to work. It is a point where money is no object. I have a desire to make my world so big that I and everyone else in it can have anything they desire. It also provides a huge margin of safety for a change in our wants and needs. It makes a lot of room for providing significant support for the causes that are important to us. Who knows, maybe we reach $3M and change our mind. But the fact that we have a high probability of reaching that point by 48 or earlier is exciting to achieve. I also find the money game very enjoyable, like a real-life game of monopoly – my favorite board game growing up. Only in real life, there are unlimited winners.